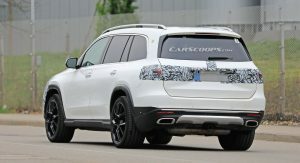 The 2020 Mercedes-Benz GLS is creeping towards its global premiere at next week’s New York Auto and Carscoops reader Geoff Olson recently snapped pictures of a prototype wearing virtually no camouflage in Birmingham, Alabama. 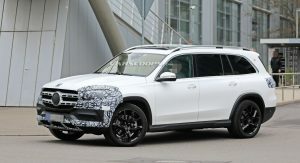 Unlike other recent spy shots which another reader sent us earlier today, these pictures show the new front fascia of the 2020 GLS. Those expecting to see a radically-different front fascia may be a little bit disappointed. 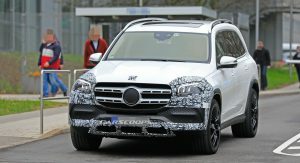 The first thing you’ll notice about the front of the new GLS is that its front grille has gone largely unchanged. Sure, its shape has been tweaked but there is still virtually the same silver, dual horizontal slats running across it. 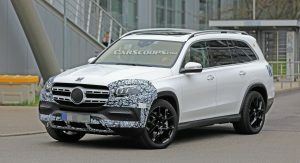 Elsewhere, we can see that the front bumper of the new GLS is similar to the car manufacturer’s current range of cars and is certainly more refined and less aggressive than its predecessor. 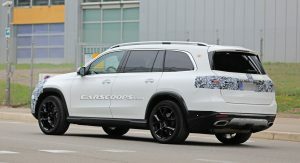 While the front of the new GLS shares some traits with the current model, the rear looks totally different and consists of new taillights and may even support an LED light bar stretching between the taillights. Mercedes-Benz designers have also worked to make the rear bumper more sophisticated and elegant. 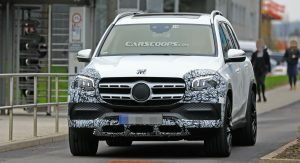 Underpinning the 2020 Mercedes-Benz GLS will be the Modular High Architecture (MHA) also used by the latest GLE. 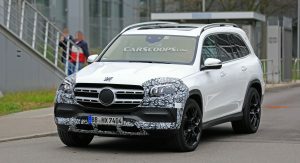 A number of six-and eight-cylinder engines will be offered for the new GLE as well as a number of hybrid or plug-in hybrids. 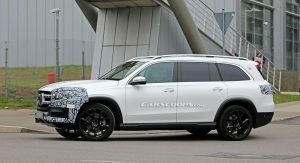 Topping out the range will be the GLS 63 but unlike the current model, it probably won’t use a 5.5-liter twin-turbocharged V8 and instead feature a 4.0-liter twin-turbo unit with 603 hp. Hat tip to Geoff Olson! and that is some pretty generous parking box…..
For that amount of money, I would buy a Range Rover. The design doesn’t nothing for me. Yeah but are you going to drive it or are you going to make love to it? Both. What’s the point of driving if you’re not making love in the process? Of course make love to it. This looks so underwhelming. I expected more. X7 actually looks more luxurious on the outside. See to me it looks exactly what I thought it would look like. All Mercedes have went for this softer blob ball. I like the overall look but I think it was to late in the game to make something more dynamic in the X7 vein. 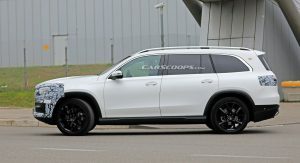 Plus the GLS looks like all the other family members so to me it looks as expected. 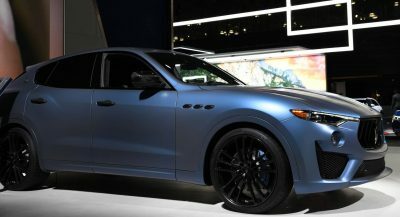 Pretty dumb comment, how can it look more luxurious from the outside? What luxury do you get from the outside of the vehicle? Ok, here is a question. Take 2 cars. One Honda Accord, and one Mercedes E-class. Tint them. Do you see which one looks more luxurious? Yeah, GLS looks like crap here. The headlight shape doesn’t work. The taillight shape doesn’t work. It’s a lazy looking design. Now take the X7 and look at the front and basic headlight design. There, X7 looks more luxurious on the outside. You don’t know what luxurious means I guess. Between and E-Class and Accord I know which one looks more expensive. This is a prototype, you can’t even see all the details yet which is why I said that was a pretty dumb, baseless comment. Merc1, i expected better understanding from you. A car can look luxurious, especially on the outside. yeah but at least this has a better looking front end and far more proportional grille to the vehicle and doesn’t look like overdrawn lips on a 6’6 drag queen who’s license reads “Mike” but hey, if that’s your thing then enjoy the X7. The X7 looks better. Huge fail by M-B. I think it actually looks good. Restrained, but large. The style fits it more than it does the GLE. That said, the X7 looks more expensive – much like the pre-facelift 7 Series looked ordinary next to the S Class. This is a reversal of roles. But…until we see them in person, we should not judge. From the first pictures i realized this big nothing is a Facelift not a new one. I can’t compare this with X7, and BMW has a Rolls Royce underneath. The funny part of this Mercedes Benz they will make a Maybach version of it . 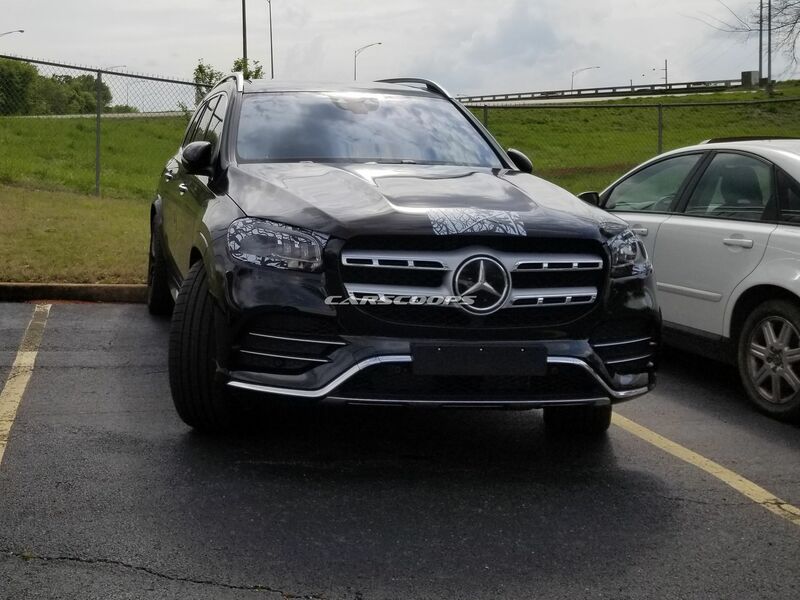 I my city are some GLs but only one GLS 500 4matic, a very expensive ugly car. You are totally clueless. 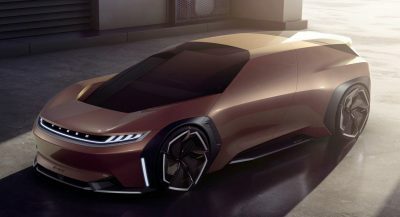 The X7 is NOT based on any Rolls architecture. This GLS is all new, not a facelift as it moves to a new platform (MHA). This generation GLS is going to be built on an entirely new platform, with new technology and engine options. The intention with Mercedes updates usually hovers on the side of slight improvements rather than radical changes on the outside and then a brand new interior all built on a new platform, so this sticks with Mercedes’ usual agenda. Personally, I prefer the more restrained styling of the new GLS, especially compared to the X7 I saw in person last week. I found it to be rather……~interesting~. 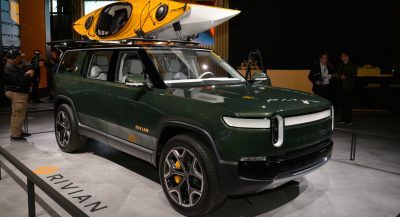 It had lots of road presence, yes, but I found the combination of slim lights, large grill, and the fact that even 21-inch wheels look small on a full-size SUV to just look…off. This GLS looks like it takes a more quiet elegance approach which I personally prefer to what I consider to be over the top and showy. Not to mention even if it is more restrained the sheer size will give it a strong presence on the road. 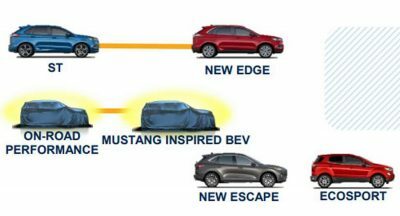 Of course the segments these 2 vehicles are in means that, aside from personal preference/brand loyalty, the interior and tech will decide which is the vehicle of choice. This is beside the fact that I would take an AMG E63 S Wagon over either of these. Your turn Audi. Give us a Q9. they have a q7 for that. Q7 is smaller. The GLS and X7 are almost the same size and have a similar starting price. then what’s q7 for? 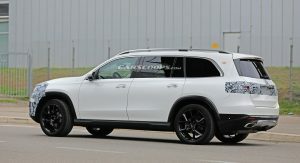 gle and x5 competitors? The interior is the same as GLE. There are some spy shots just google it. I still prefer BMW X7, it looks more luxurious. This new GLS looks off-road-ish but most buyers will never take it off-road. 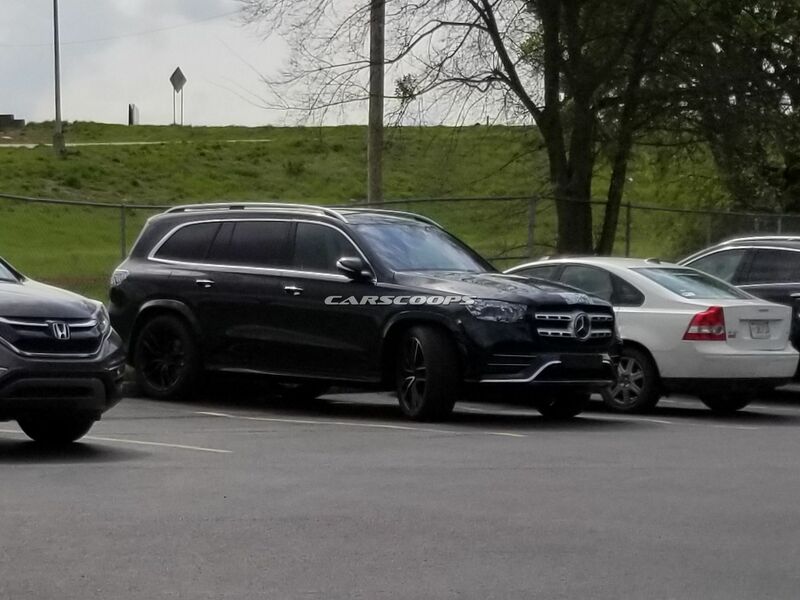 Looks like a long wheelbase Toyota Highlander. Nowhere near as nice as the new X7. i like it more than x7. its simple almost sculptural form, elegant, kinda understated. Not as bad as x7 but still not matching price and heritage. What the heck is the point of putting just a tiny sliver of camo on there? 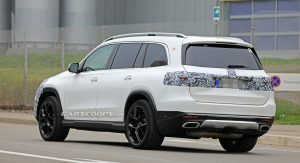 I will patiently await the arrival of the all-new 2020 Escalade, which is something to await for patiently. 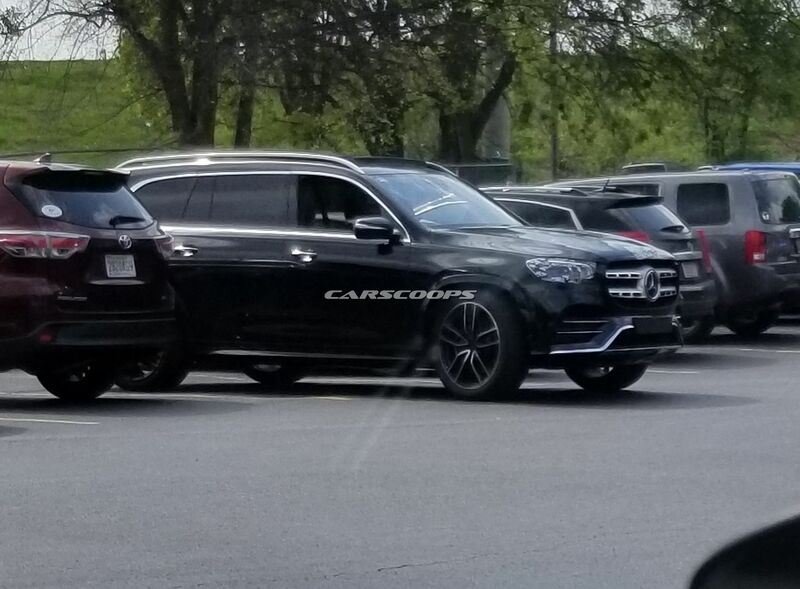 For the amount of time people have waited for this thing to live up to its alleged S-class relationship, anything less than revolutionary design is almost a joke. I would have loved to see a bolder approach. Perhaps I’m emotional and speaking a bit prematurely. Impossible to get excited over yet another premium SUV. Dull.